I’m planing on doing a Year in Review post after Christmas but I thought in the meantime a ‘These Are A Few Of My Favorite Things’ post would be appropriate since one of my favorite Christmas movies is The Sound Of Music after all (but it comes second to Bad Santa – can you tell I went to Catholic school growing up and I’m very conflicted about Christmas?). Anywhoozle, I thought this was a really great year for product designs and while last year I didn’t buy a lot, this year I got more and I also passed on a ton of items that I reaaaaally loved. And so this list is the things I love and the ones that got away. this one came out last year on boxing day and it looks as though they have renamed it the Run: Stay On Course Pullover for this year. Definitely will get that one in Pigment Blue when it’s out, or maybe Pig Pink. I just love the brushed fleece for running and how durable it is. I LOVE this hoodie. I think its the loosely knit organic cotton and how pajama-y it feels. I hope they make a jacket again this year using the same material. These are the only run crops I got this year and I love them both for the fit/function and for all of the feminine design features on it. I wore these for my half marathon in May and they were super comfortable. 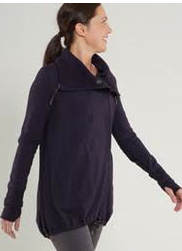 This is a great long hoodie for all of us short ladies. I do love the Live Simply Jacket but the length just doesn’t work with my proportions. Heathered Navy is such a beautiful color, I hope they use it again. This is one run top that I wish they would carry thru in various color runs. I would have loved this in any of the pinks or Rocksteady. This one is my favorite run item for the entire year. I was really surprised that I loved these pants so much. I hadn’t planned on getting track style pants at all and these were an impulse purchase. I love that they are plain without any seams or busyness on them. I love that they are Glyde instead of the swift used in Dance Studio Pants. My only complaint is that I wish it had gone up to 12 and I also wish the thighs were slightly roomier. Oh boy, the Gratitude Wrap. People have waited a long long time for the return of the GW and finally it arrived resulting in total website armageddon. I love the Black Swan one with the patterned inner liner. The other colors just weren’t special enough to purchase a second wrap but if it came in something like Paris Pink, Currant or something fun like a grey with a bright pink lining than I think I would get another one. Finally! The cherry red everyone has been waiting for. I only got the CRB in this color but it is really a gorgeous shade. I am not a fan of Power Y’s but this print just called to me. I’m so glad I got it because it’s really a lot of fun and we didn’t see many items with this print on it. I am living in my Cabin Tee LS’s and I’m just surprised none of my friends or family have made fun of me for it yet. Literally, I wear them every day. 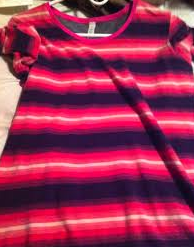 My favorite one is the Pink Ombre Stripes one. In pictures I thought the pink was a little loud but in person it’s quite pretty. I got this jacket because I just loved it in photos but once I had it I became a little shy about wearing it because of the bulky neckline and I almost ended up selling it. I had a change of heart though and realized that half zipping the outer zipper really reduces the bulk of material around the neckline and it’s become my go-to jacket on non rainy days. Its definitely warm enough for a Vancouver winter and it looks really great with jeans or wunder unders. This one is just cute and cozy. And I loved it in this color. My last purchase of the year which was a fluke find at my local store the other day due to an online return. I missed out on ordering it online since the product shots didn’t include a view of the reverse side which is the prettier side in my opinion and I would have definitely ordered it had I know it reversed to a solid color. I almost immediately regretted not ordering it when I went to my store and learned they would only be getting them in Black and Grey. Whenever I see pictures of this CRB I always pine for it. It’s so pretty and exactly the type CRB I’d wear all the time. I’m confused as to how I talked myself out of getting it when they were in store. I think I told myself I had too much blue in my closet. I love the Aura Jacket in Iris I got so much but I wish I’d also gotten this neutral one to go with anything since so much of your top underneath shows. If I can find a NWT one on ebay one day at a reasonable price I’ll definitely be getting it. I love this top for the color and that its a long sleeve but I passed on it because I didn’t love the material so much for a snug fitting long sleeve top. Too bad we didn’t see a Full Tilt LS in heathered or solid Raspberry. Again, this Rocksteady is a color that I love. One of my favorites of the year. How did I not get this jacket??? I think I told myself that I needed to wear darker colors. Dumb! I love this jacket, the fit and how warm it is but I was not prepared to pay $320 for a really warm jacket for a mild winter. It still hasn’t gotten really cold here in Vancouver yet and were having a Green Christmas so I know I made the right decision. Instead I got a $79 Lands End Down Jacket in case it gets really, really cold as the weather nerds are predicting it will be here in Vancouver. Loved the Heathered Black Swan in every picture I’ve seen of it but in person the color looked really dull on me so I returned it. 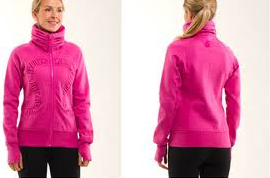 I loved this jacket in this color but passed because I already have last years Hustle Jacket and love that one too. 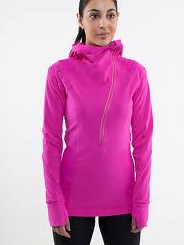 Love the look of this pullover in both Currant and Paris Pink but tech fleece is way too hot for me to wear running and so I could not justify it. Sad times. 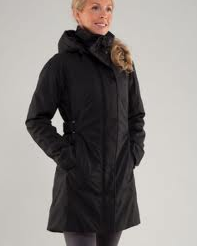 It was not even a consideration to purchase this Cuddle Up Jacket for $200 but I sure love it. The lace overlay is super pretty in person. Loved this cuddle up as well, especially in pictures. Both times I tried it on in stores though I passed on it reluctantly. Something about the jacket in person fell short on me. One of those items that whenever I see it on someone else I will look at it wistfully. "New! Pigment Blue Run: Stay On Course Pullover and Back On Track Tank"